Baghdad (AFP) - Attacks in Iraq, including a suicide bombing at a university in north Baghdad, killed at least 14 people on Sunday, security and medical officials said. The attacks, which come as Iraq suffers a prolonged surge in bloodshed, took place less than two weeks before a parliamentary election that will be a major test for security forces. 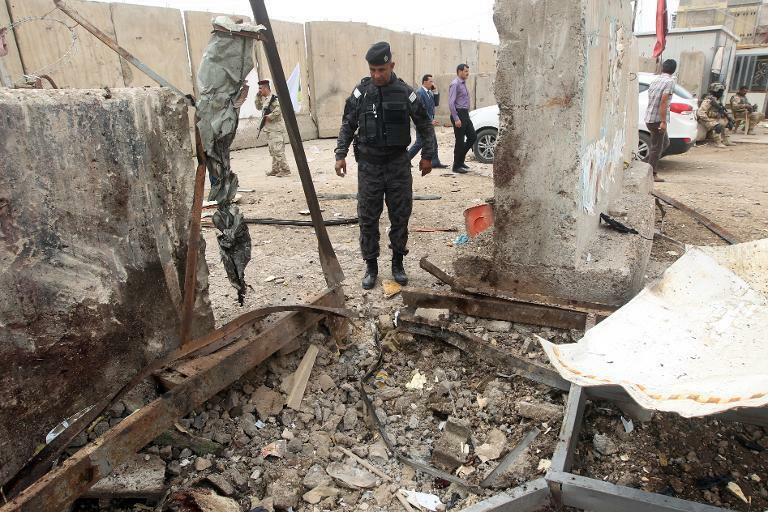 Officials gave varying accounts of the bombing of Baghdad's Imam Kadhim University. A police colonel said a suicide attacker entered the university before setting off explosives, while another bomber and a gunman were killed by security forces. An interior ministry official said the bombing took place at the entrance to the university, while a second bomber was shot dead. The attack killed at least five people and wounded at least 13, officials said. Iraq is hit by daily bombings and shootings that kill hundreds of people each month, but attacks targeting universities are relatively rare. In Babil province, south of Baghdad, a car bomb killed three people and wounded four, while two more car bombs killed three people and wounded 26 in Al-Rumaitha in Muthanna province, further south. And in Saadiyah, north of Baghdad, a magnetic "sticky bomb" on a vehicle killed an army lieutenant colonel, while two police were shot dead at a checkpoint south of the northern city of Mosul. Iraqis vote on April 30 in the first parliamentary election since American troops left the country in late 2011. While they were able to keep violence to a minimum during provincial polls last year, security forces have failed to halt a subsequent year-long surge in unrest. The heightened violence has been driven principally by widespread anger among the Sunni Arab minority, who say they are mistreated by the Shiite-led government and security forces. It has also been fuelled by the bloody civil war in neighbouring Syria, which has bolstered militant groups. In another sign of the reach of militant groups and the weakness of security forces, shifting parts of Anbar provincial capital Ramadi and all of Fallujah, both west of Baghdad, have been outside government hands for more than three months. The crisis in the desert province of Anbar erupted in late December when security forces dismantled Iraq's main Sunni Arab anti-government protest camp just outside Ramadi. It is the first time anti-government forces have exercised such open control in major cities since the peak of the deadly violence that followed the US-led invasion of 2003. Violence has killed more than 470 people in Iraq this month and upwards of 2,700 this year, according to AFP figures based on security and medical sources.